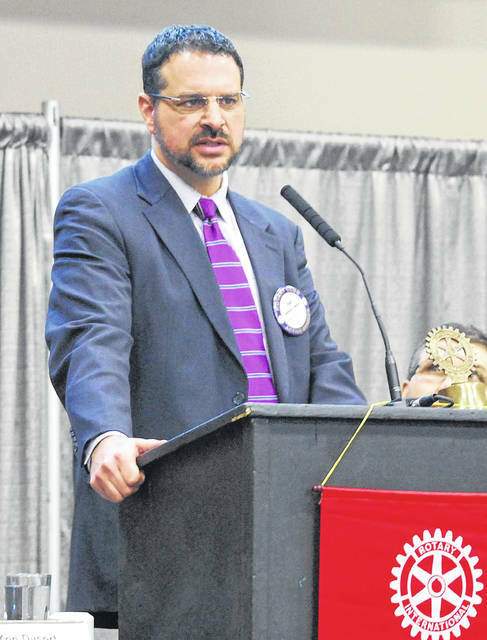 Assistant Allen County Prosecuting Attorney Tony Miller was the guest speaker Monday at the Presidents Day meeting of the Lima Rotary Club. LIMA — Perhaps it was an appropriate topic for a Presidents Day gathering. 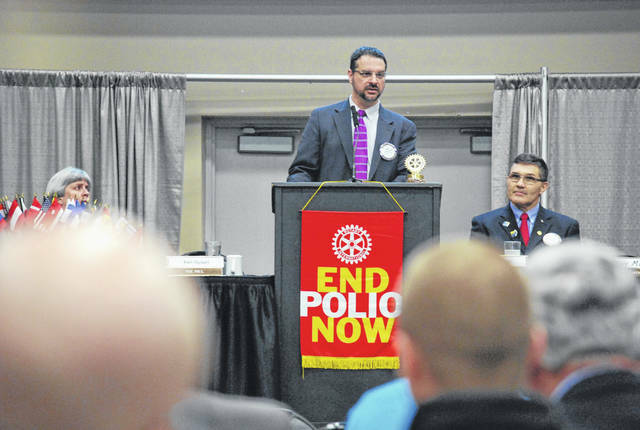 On a day set aside to honor some of the pillars of a democratic society, members of the Lima Rotary Club on Monday got a refresher course in one of the cornerstones of that democracy: a criminal justice system designed to work for the public as well as to protect it. Anthony “Tony” Miller, chief assistant prosecutor with the Allen County Prosecuting Attorney’s Office, is a graduate of Bath High School who left for the big city to practice following his graduation from law school. He made decent money practicing law in Columbus, but it was upon his return to Lima and a job in the prosecutor’s office that Miller found his appreciation for the legal profession. Miller said he and each his colleagues in that office live by the same creed every day. “We try to do the right thing for the right people for the right reasons,” the assistant prosecutor said. “Now what is ‘right’ is sometimes a judgment call, and we get paid to make those decisions, using our moral compass. Attorneys in the county prosecutor’s office — there are 12 of them — work in either the civil, juvenile, children’s services or adult criminal divisions of the office. Miller specializes in civil and adult criminal cases and said he especially enjoys taking part in working closely with law enforcement investigators to piece together the elements of a crime. He explained the process of how criminal cases evolve and noted that all criminal cases are submitted to a grand jury to determine if probable cause exists to proceed to trial. There are multiple factors that go into a plea bargain, Miller said, not the least of which is the heavy caseload in the courts. “Our office averages more than 500 cases a year. There are two courtrooms and two judges. The economic reality is that is takes about $5,000 to try a case, and sometimes a deal just makes sense,” Miller said. Also taken into consideration is the potential emotional toll on crime victims — especially children — and the fact that potential witnesses often seem to develop “amnesia” and do not cooperate. “My goal is to serve you, the taxpayer, well — to be a good steward of your tax dollars, and to continue to seek innovative ways to meet the growing challenges” of an ever-changing society, Miller concluded.